Yes, the Israeli Cable TV provider, saw an opportunity when President Barack Obama, as a candidate in 2008, adopted the slogan "Yes We Can." After all, Yes has been broadcasting in Israel since July 2000. And as the U.S. presidential election was in full swing, Yes was getting ready to launch its high definition service, YesMaxHD. 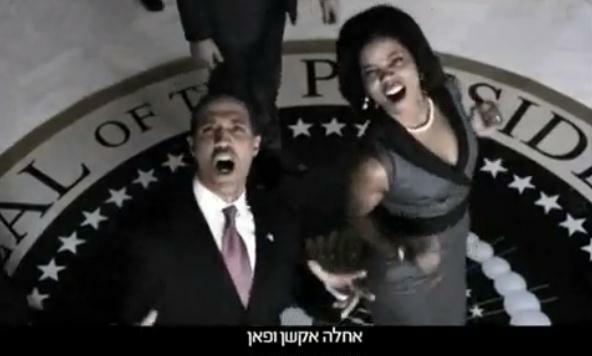 So Yes and its advertising agency, McCann-Erickson, came up with a song and dance commercial featuring Barack and Michelle Obama lookalikes seemingly plugging the newly offered Israeli HDTV service. Yes is Israel’s only provider of multi-channel television broadcasts via satellite and was the first company to offer digital broadcasts and interactive television services. The company has over 560,000 subscribers comprising more than 38% of Israel’s multi-channel television market. The company transformed Israel's TV broadcasting sector, which was dominated by a cable monopoly offering an outdated analog product that provided a limited choice of content. It's time to check out another of Israel's funniest TV commercials. We're always looking for more to share with you. Enjoy!